"It will not take much to ignite Lithium Bull again - just four words will do: China, Pollution, Tesla and Apple. We have written extensively about three of them before and now we can have the groundbreaking development with Apple thinking about joining the Electric Party. Lithium investment theme will fit very well with this conglomerate. 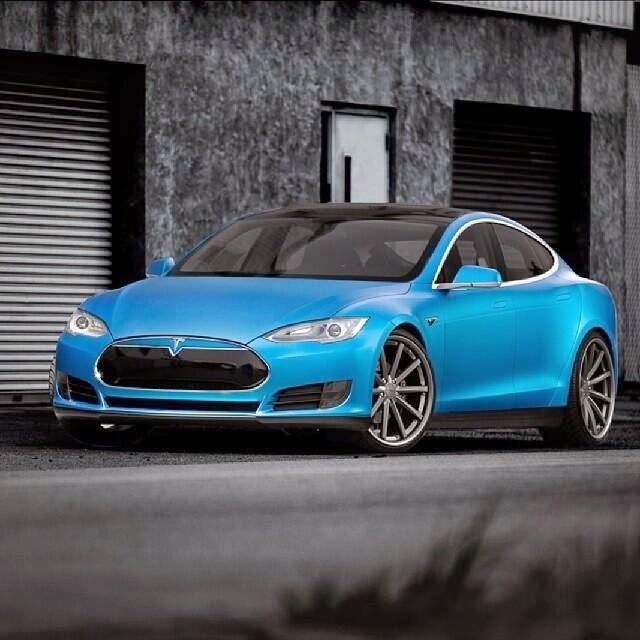 Lithium batteries are everywhere: in every Apple mobile device, in every Tesla electric car. 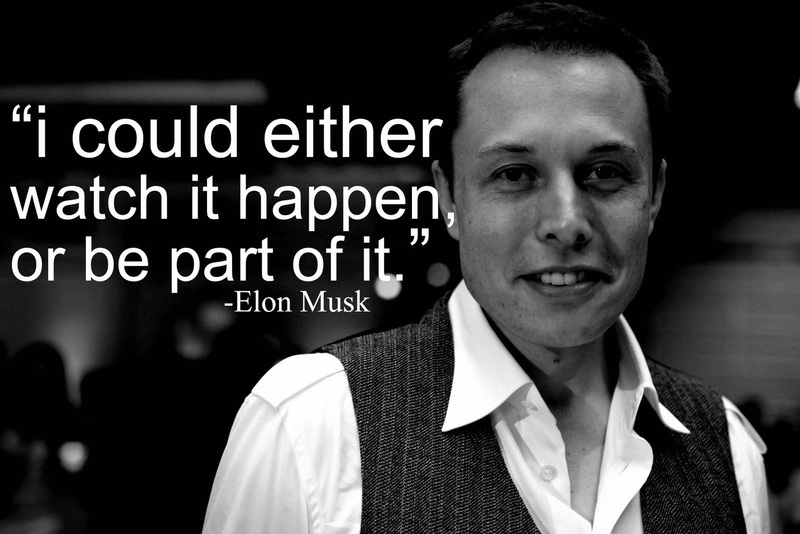 It is not a coincidence that Tesla is preparing plans to build super Lithium battery plant. All these plans: Tesla Model X launch, Tesla Model E for mass market development and Lithium Battery plant will need a lot of Capital and Apple has it. Is it the match made in heaven? 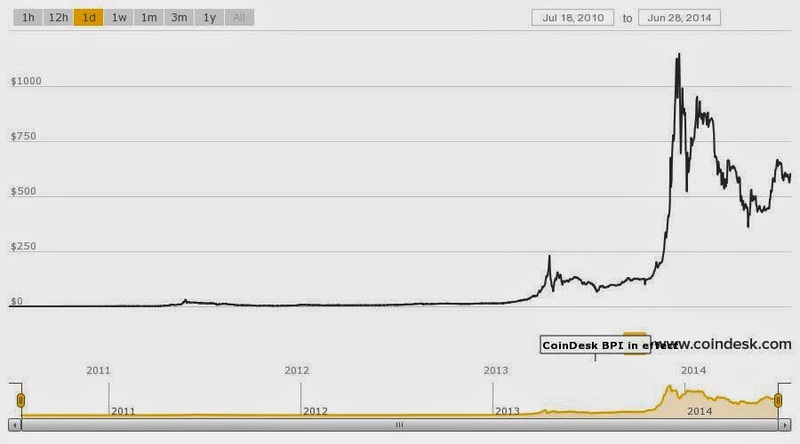 We will see very soon, but investors are better take notice about this trend already." 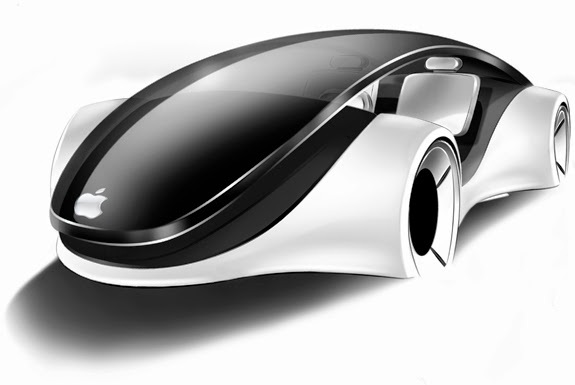 Powered By Lithium: Will Foxconn Make The Electric iCar For Apple Priced Under $15,000? "Foxconn is not talking about the use of Tesla Motors patents or Apple being involved at this stage, but this is the kind of developments I am expecting to happen more and more after Elon Musk went Open Source with Electric Cars and opened Tesla patents to all. Foxconn is the largest contracts electronics maker in the world, including production of iPhones and iPads for Apple. I am not sure that we can certainly expect now that my dream - the Electric iCar will be produced by Foxconn, but they are the one who can make it. 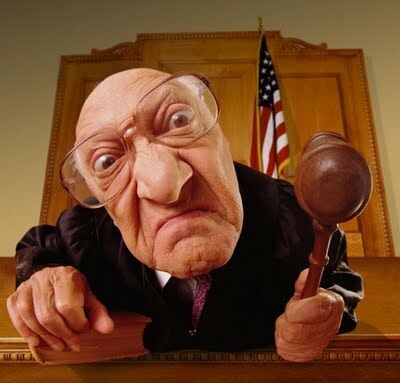 "Asked by the same shareholder about Hon Hai’s reported cooperation with U.S. electric car pioneer Tesla Motors Inc., Gou said he would not comment on any single client, adding only that Tesla is a good company and can help Hon Hai understand future trends in the car industry. TheChinaCap." Everything new in this life was started with the simple question: Why Not? 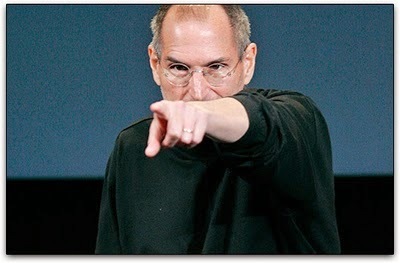 Can we start talking that Tesla, Apple and Foxconn Is A Match Made In Heaven To Make Electric Apple iCar Under $15k? Tesla and Apple have met after all discussing SOMETHINGbefore. Whether it was Tesla Gigafactory for potential production of Lithium Polymer Batteries for iPhones and iPads or my beloved Apple iCar my "Chinese tea leaves" are not telling me at the moment, but these three companies have everything in the world to make the mass market for Electric Cars happen overnight: Apple with its Billions of Capital, iconic brand and marketing machine, Tesla Motors with Electric Cars Lithium Technology and Foxconn with its Low Cost Manufacturing Base for mass market production and entry into the world's largest auto-market in China. "It will not take much to ignite Lithium Bull again - just four words will do: China, Pollution, Tesla and Apple. We have written extensively about three of them before and now we can have the groundbreaking development with Apple thinking about joining the Electric Party. Sufiy." Before we all get very excited let's see where this story will land in the end and who are those clients of Foxconn they are not talking about now? We at International Lithium are working on development of our Lithium Projects to make these dreams and mass market for Electric Cars possible one day in the nearest future. It will be done by somebody, I am sure - now we have some names to talk about. "Rare Earth elements or metals (REEs) are essential elements in clean-energy technologies. In recent years REEs have received plenty of coverage concurrent to growing environmental concerns. The rare-earth topic is no longer obscure and discussions regarding future REE shortages are beginning to emerge in mainstream media. Today international governments and organizations are pushing efforts to develop solutions to the rising scarcity threat, one of the biggest being that only 1 percent of critical materials are currently being recycled (they are difficult to recover economically), and so the race to find viable sources for REEs is on. 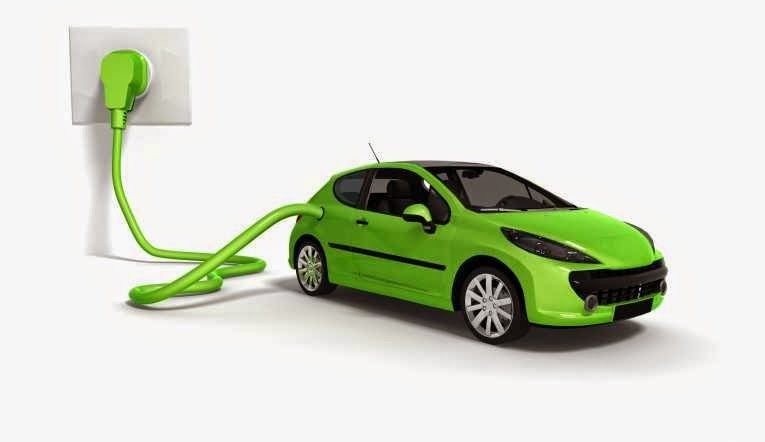 The Green Technology Industry is the largest end-user of REEs and is continually growing with the development of electric vehicles and green energy electrical generators; wind turbines and solar panels. According to the American Chemistry Society, Lithium is among these endangered metals. China, which controls 97% of global rare earth production, has made significant investments in securing their supply. One excellent example of this is the recent news from China based Ganfeng Lithium Corp. regarding their 15million yuan (US $2.4 million) investment into International Lithium’s Blackstairs Pegmatite project in Ireland and the Mariana Brine project in Argentina for the 2014 budget year. Ganfeng Lithium Corp. is one of the largest lithium product suppliers in the world supplying ILC with both capital and expertise and providing the global green technology industry with a new potential source of lithium supply. Read more." 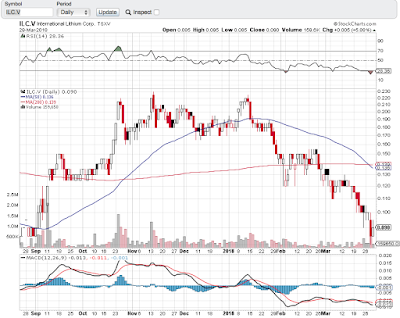 International Lithium: Tesla Goes Open Source, Ganfeng Lithium Goes for Vertical Integration. 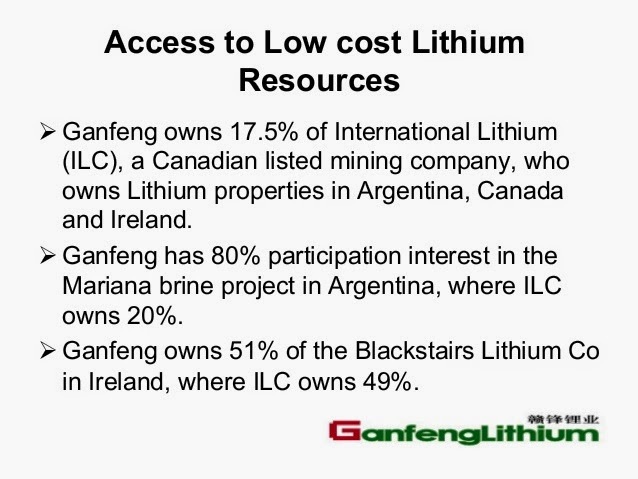 "Ganfeng Lithium news is making rounds now in the industry circles and Resource Investing News has published an interesting article on the recent developments in the Lithium and Electric Cars space. Read more." International Lithium: Ganfeng Lithium Acquisition of Lithium Battery Company To Build The Vertically Integrated Industry Chain. Hon Hai Precision Industry Co., a Taiwanese assembler of Apple Inc.’s iPhones and iPads, said Wednesday it is planning to make electric cars priced with an extremely affordable price tag — under US$15,000. “The electric cars made by us will be very affordable,” said Terry Gou, chairman of the world’s largest contract electronics maker, in response to a question during an annual shareholders’ meeting. Unlike current models that run as much as NT$2 million (US$66,800), most of the electric cars developed by Hon Hai will be priced under US$15,000, Gou said. He declined to give details on the cars or indicate when they may be launched. Asked by the same shareholder about Hon Hai’s reported cooperation with U.S. electric car pioneer Tesla Motors Inc., Gou said he would not comment on any single client, adding only that Tesla is a good company and can help Hon Hai understand future trends in the car industry. “This kind of technology is due in the next 10 to 20 years, and our company will make huge investments in it,” Gou said. Hon Hai, often referred to by its trade name of Foxconn Technology Group, is seeking to transform itself into a technology services company to meet consumer demand and generate business growth in the coming years. In its annual report to shareholders, Hon Hai said it is evolving from its existing “Integration-Innovation-Design-Manufacturing” base into cloud services, wireless 4G-LTE networking services and the e-commerce sector. By the time the fifth generation (5G) of telecommunications rolls around, the company will shift its focus to developing automation and artificial intelligence and combining hardware and software applications to improve human life, the annual report said. Hon Hai shares fell 1.73 percent to close at NT$96.50 Wednesday in Taipei trading. Peak Oil Is Back! 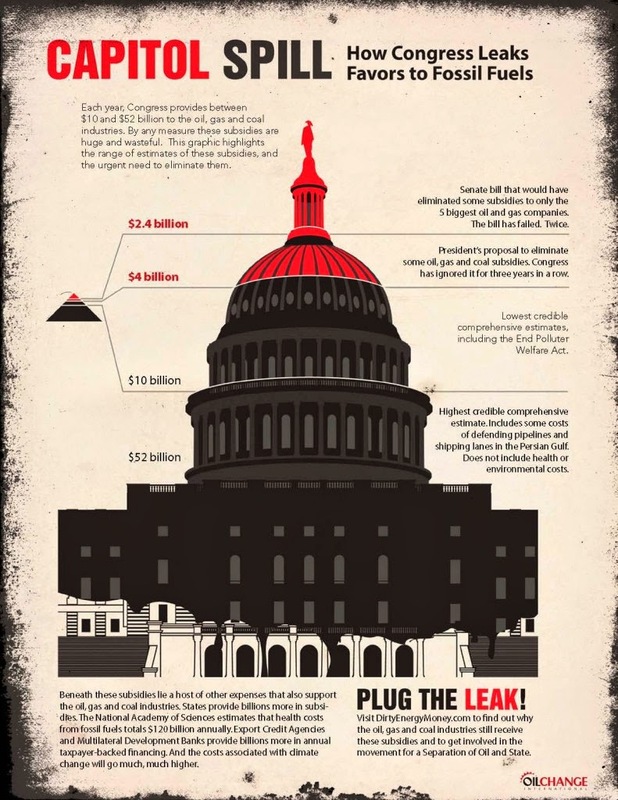 Secret Trade Memos, TTIP And Write-down Of Two-thirds Of US Shale Oil Explodes Fracking Myth. "According to a secret trade memo obtained by the Huffington Post, the Obama administration and the European Union are pushing ahead with efforts to "expand US fracking, offshore oil drilling and natural gas exploration", as well as exports to the EU, under the prospective Transatlantic Trade and Investment Partnership (TTIP) agreement. The Guardian." NATO: Russian Spies Against "100% Safe Fracking", Two-thirds Of US Shale Oil "Could Be Stolen By Chinese Hackers." Even Golden Bubbles Are Made Of Bubbles: Bitcoin Vs. Gold - Some Thoughts And Infographic. "Some wise, but very dangerous men once said: "We will take the best out of Them, we will intrigue them by Enigma and Secret, we will make Them think that they are running the world ... but it will be Us who is really in charge." Do you see the historical parallels? 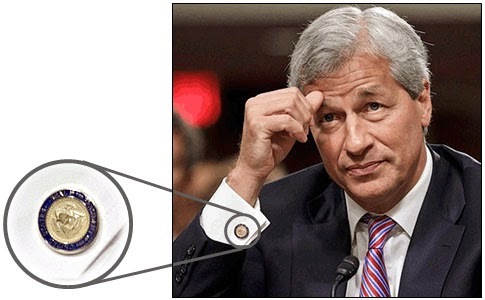 "Brothers" are still in denial and Bitcoin "revolutionaries" are fighting the FED ... "
Peak Oil Was Just Postponed - IEA Write-down Of Two-thirds Of US Shale Oil Explodes Fracking Myth. "Jim’s first topic on the Big Picture this week is “Peak Oil – Delayed but Not Resolved”. Jim lays out the issue of Peak Oil in depth, and quotes studies that believe it could still arrive by the end of this decade. Jim also looks at the Shale Revolution in the US and discusses how long the shale story may delay the onset of Peak Oil. The next topic is “OPEC’s New Competition”. Jim looks at the geological and geopolitical constraints on OPEC and sees North America as a growing and viable competitor to OPEC’s energy dominance in the future. Jim Puplava." Write-down Of Two-thirds Of US Shale Oil Explodes Fracking Myth. Next month, the US Energy Information Administration (EIA) will publish a new estimate of US shale deposits set to deal a death-blow to industry hype about a new golden era of US energy independence by fracking unconventional oil and gas. EIA officials told the Los Angeles Times that previous estimates of recoverable oil in the Monterey shale reserves in California of about 15.4 billion barrels were vastly overstated. The revised estimate, they said, will slash this amount by 96% to a puny 600 million barrels of oil. The Monterey formation, previously believed to contain more than double the amount of oil estimated at the Bakken shale in North Dakota, and five times larger than the Eagle Ford shale in South Texas, was slated to add up to 2.8 million jobs by 2020 and boost government tax revenues by $24.6 billion a year. "... the star of the North American show is barely on most people's radar screens. California shale will... reinvigorate the Golden State's economy over the next two to three years." This sort of hype triggered "a speculation boom among oil companies" according to the LA Times. The EIA's original survey for the US Department of Energy published in 2011 had been contracted out to Intek Inc. That report found that the Monterey shale constituted "64 percent of the total shale oil resources" in the US. "From the information we've been able to gather, we've not seen evidence that oil extraction in this area is very productive using techniques like fracking... Our oil production estimates combined with a dearth of knowledge about geological differences among the oil fields led to erroneous predictions and estimates." The Intek Inc study for the EIA had relied largely on oil industry claims, rather than proper data. Hitesh Mohan, who authored the Intek study for the EIA, reportedly conceded that "his figures were derived from technical reports and presentations from oil companies, including Occidental Petroleum, which owns the lion's share of oil leases in the Monterey Shale, at 1.6 million acres." Mohan had even lifted his original estimate for the EIA to 17 billion barrels. "The oil had always been a statistical fantasy. Left out of all the hoopla was the fact that the EIA's estimate was little more than a back-of-the-envelope calculation." Last year, the Post Carbon Institute (PCI) published Hughes' study,Drilling California: A Reality Check on the Monterey Shale, which conducted an empirical analysis of oil production data using a widely used industry database also relied on by the EIA. The report concluded that the original EIA estimate was "highly overstated," and unlikely to lead to a "statewide economic boom.... California should consider its economic and energy future in the absence of an oil production boom." "Given the incredible difference between initial projections of 15 billion barrels and revisions to 600 million, does this not call into account all such global projections for tight oil?" As I'd reported earlier in June last year, a wider PCI study by Hughes had come to similar conclusions about bullish estimates of US shale oil and gas potential, concluding that "light tight oil production in the USA will peak between 2015 and 2017, followed by a steep decline", while shale gas production would likely peak next year. In that post, I'd pointed out previous well-documented, and alarmingly common, cases of industry over-estimates of reserve sizes which later had been questioned. Analysts like Jeremy Leggett have said, citing exaggerated oil industry estimates, that if reserve and production reality are indeed significantly lower than industry forecasts, we could be at risk of an oil shock as early as within the next five years. The latest revelations follow a spate of bad news for industry reassurances about the fracking boom. New research published this month has found that measured methane leaks from fracking operations were three times larger than forecasted. The US Environment Protection Agency therefore "significantly underestimates" methane emissions from fracking, by as much as a 100 to a 1,000 times according to a new Proceedings of the National Academy of Sciences study published in April. The Associated Press also reported, citing a Government Accountability Office investigation, that the US Interior Department's Bureau of Land Management had failed to adequately inspect thousands of oil and gas wells that are potentially high risk for water and environmental damage. Despite the mounting evidence that the shale gas boom is heading for a bust, both economically and environmentally, both governments and industry are together pouring their eggs into a rather flimsy basket. According to a secret trade memo obtained by the Huffington Post, the Obama administration and the European Union are pushing ahead with efforts to "expand US fracking, offshore oil drilling and natural gas exploration", as well as exports to the EU, under the prospective Transatlantic Trade and Investment Partnership (TTIP) agreement. Dr. Nafeez Ahmed is an international security journalist and academic. He is the author of A User's Guide to the Crisis of Civilization: And How to Save It, and the forthcoming science fiction thriller, Zero Point. Follow him on Facebook and Twitter @nafeezahmed." Kirill Klip. 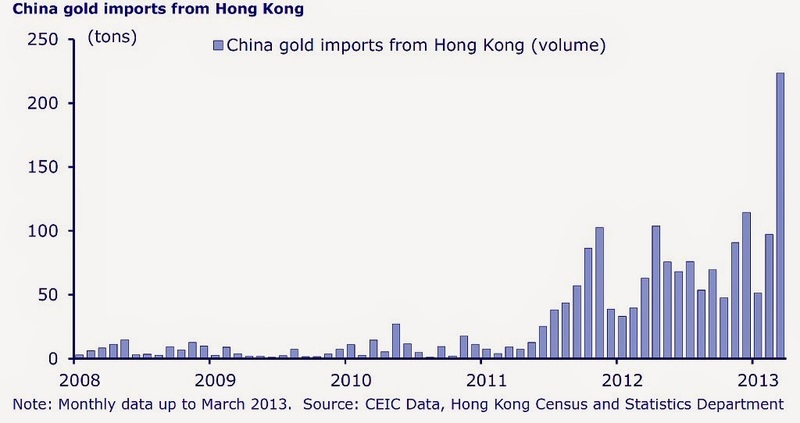 : Even Golden Bubbles Are Made Of Bubbles: Bitcoin Vs. Gold - Some Thoughts And Infographic. Even Golden Bubbles Are Made Of Bubbles. 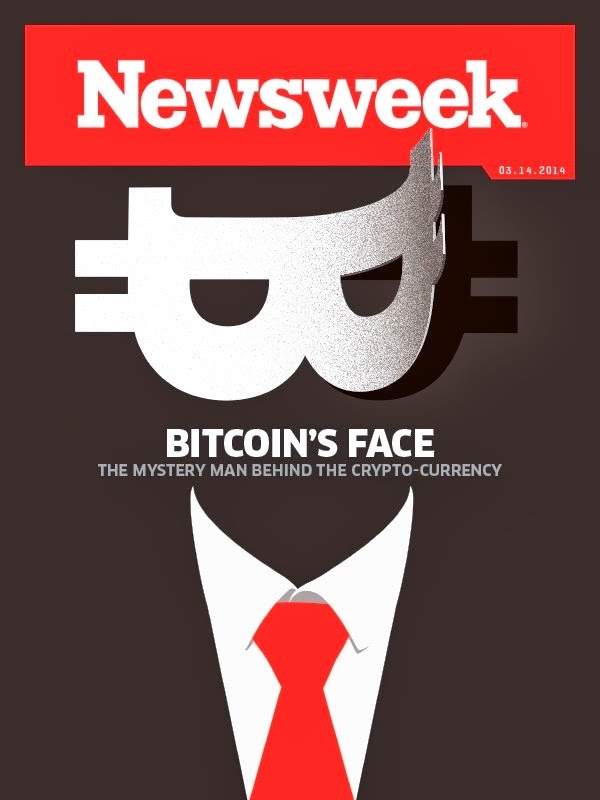 I was following Bitcoin for a while ... and other 50 crypto-currencies. Once the amount of crypto-ideas about Gold 2.0 exceeded 60 - I have lost my interest. 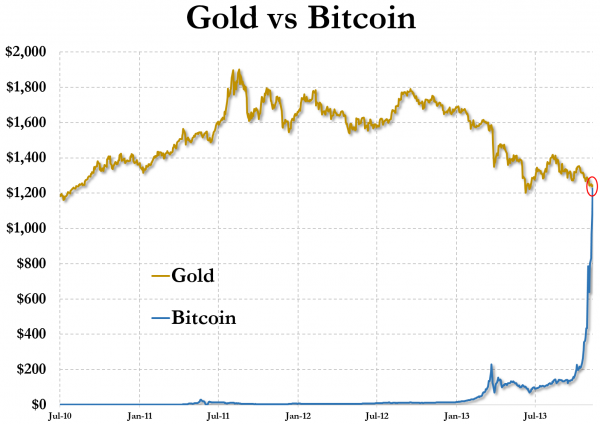 But the last Fall moment was truly historical: when Bitcoin has briefly touched parity with Gold. I will leave you to your own studies on this subject, but will mention only one particular angle. Bitcoin was supposed to be the competition to FIAT currencies. Why there is such a "tolerance" from authorities in U.S. - compare to the "FED's 100 years War on Gold"? Maybe I know the answer, maybe you will find another one. Gold is finite and the Only Money accepted for thousand of years as such. It cannot be printed or created in any way apart from the very hard work to discover and recover it from the ground. 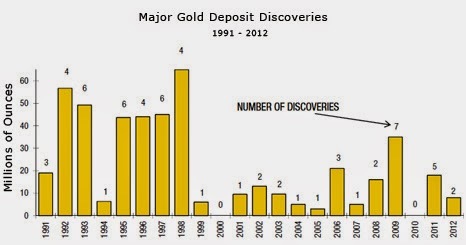 Gold companies are mining the dust now compared to the 90s and new discoveries are few and far between. 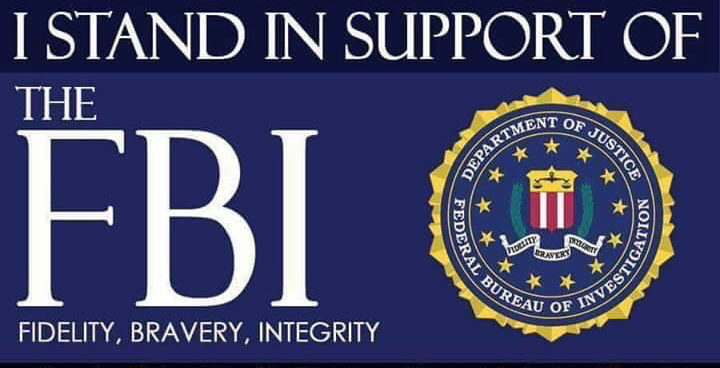 Bitcoin, on another side, can be manufactured at Will and there is the different opinions about the Control of this Will in Bitcoin case, but NSA will always provide you with the better substitute of Bitcoin at some point: NSAcoin. Chris Martenson: The Perfect Business Case - Exponential Money And Limited Resources Supply. "The newest edition of the annual In Gold We Trust report is out. This eight edition goes again to the heart of gold’s value and analyzes the yellow metal as a monetary asset rather than an industrial commodity. The In Gold We Trust 2014 report takes a sober look at the big picture in the monetary system and offers a holistic analysis of the gold sector. It is written by Ronald Stoeferle who is the managing partner of a global fund at Incrementum AG in Liechtenstein, based on the principles of the Austrian school of Economics. GoldSilverWorlds."